PROVEN, POWERFUL AND RELIABLE KUBOTA DIESEL ENGINES: The M6 Series is powered by two of the most powerful Kubota diesel engines in our line-up. M6-101/M6-111 – The V3800, 3.8 liter turbocharged engine boasts 97.1 and 106.8 net HP and is Tier 4 Final compliant. This Tier 4 Final, clean burning, fuel efficient engine is proven and widely used among Kubota’s M Series line of tractors. 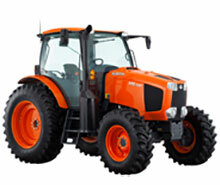 INTELLI-SHIFT TRANSMISSION: All four models of M6 tractors feature Kubota’s 24 Speed Intelli-Shift transmission. The Intelli-Shift transmission features 8 powershift gears in each of the three ranges. With the powershift buttons and the range lever incorporated together, finding the right gear for field work or travel is simplified. Each M6 also includes two Auto Shift modes, for Travel and Field work, giving the M6 the ability to work smarter and more efficiently for the operator. The M6 Series also includes a left-hand electro-hydraulic forward/reverse shuttle that is cleverly located behind the steering wheel, enabling the operator to shuttle from forward to reverse without removing their hands from the steering wheel. DELUXE FLOW-CONTROL REAR REMOTES: When precision and ultimate control is needed for rear attachments, operators will appreciate the deluxe flow-control rear remotes. This gives the M6 Series’ pressure compensated, fixed displacement hydraulic system finite control and precise operation.